Below is the campaign screen that you’ll see if you’re a newcomer to the series and you have never purchased the base game. You have immediate access to the bootcamp campaign (at the top) and all of the other campaigns (which are DLCs) are grayed out but you can still click on them! Click here for new screenshots and more information! 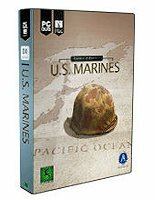 U.S. Marines, the latest expansion for Order of Battle: Pacific, has been released on PC and Mac! Are you ready to be thrown into the adventurous island-hopping campaign of 1942-1945? A long and bloody military operation that starts with the assault of Tulagi and advances across small and isolated jungle islands, reaching up to the iconic epilogue at Iwo Jima. Order of Battle: U.S. Marines is the second expansion of the franchise and it includes a campaign with 11 brand new scenarios against the Imperial Japanese troops. You’ll fight, amongst others, the historical battles of Guadalcanal and Tarawa. In these savage landscape enemies adapt their strategy from ruthless assaults to deep and well-prepared defensive systems. Fight with the new U.S. Marines faction, deploy many new units on the battlefield and employ the new support fire ability for Heavy Infantry. Onwards to victory! Semper fidelis! A special 10% launch discount on the expansion is available for a limited time period! Watch the Order of Battle: U.S. Marines launch trailer here. Last but not least, don’t miss the Twitch stream tonight at our official Twitch Channel at 8PM CEST / 6PM UTC / 2PM EDT! With the release date of Order of Battle: U.S. Marines drawing near, we have decided to prepare a little treat for everyone interested in the WW2 era: some infographics showing the maps and interesting facts from three of the eleven new scenarios included in this expansion. Which is completely focused on the “uncommon valor” of the American Marines in the Pacific Theatre. Order of Battle: U.S. Marines is the second expansion for Order of Battle: Pacific and it’s due to release on 7th April! 6 months after Pearl Harbour, the Greater East Asia Co-Prosperity Sphere has reached its peak of expansion. Australia and New Zealand are under direct threat, weakening more and more the American ability to intervene in the Pacific. Only decisive actions to take the initiative could allow the Allies to re-establish a naval and air superiority over the Imperial Army. The Artistocrats – developers of the Order of Battle series – aren’t resting on their laurels not even after the success of Order of Battle: Morning Sun, the second expansion of the innovative turn based wargame Order of Battle: Pacific! Today we are announcing a new chapter in the series, adding a new challenging set of scenarios and a new faction: the US Marines Corps! This expansion has opened its gates to Beta testers and we are inviting all the players to enlist and to concur in defining this great milestone! You can apply for the Beta from here! Order of Battle: US Marines will be available also on Steam! After the incredible success of the wargame Order of Battle: Pacific and its free DLC Battle of Britain, the developers from The Artistocrats studio have raised the level of the challenge! With their new expansion Order of Battle: Morning Sun they have switched the focus onto the Second Sino-Japanese War, which started few years before the attack on Pearl Harbour in World War II. In Order of Battle: Morning Sun you will take control over the Japanese forces in their attempt to take advantage of the Republic of China. But you will soon discover that better equipment and training could be counteracted by force of numbers and by fierce resistance in the backlines! Discover new iconic units and face the vastness of the battles employing tanks, air fighters, amphibious assaults, and even war horses! Do you want to know more? Follow the Twitch Stream today at 20:00 CET / 19:00 UTC / 2:00 PM EST on our official Twitch Channel! Order of Battle: Morning Sun is an expansion for Order of Battle: Pacific and requires the base game to be played. The second Sino-Japanese War was a cruel and bloody conflict often overlooked due to its proximity to the Japanese entry into World War 2 at Pearl Harbour. But the events of this campaign had a great impact on the future of the people and armed forces of both nations. This conflict, and its protracted nature in the later years, could be seen as one of main causes of the final Japanese defeat. It greatly drained the Empire’s resources, forcing it to deploy thousands of soldiers and war-ships and defend against repeated guerrilla attacks. In Order of Battle: Morning Sun, the second expansion of the innovative wargame Order of Battle: Pacific, you will revive the battles and operations of this crucial war, from the initial boarder’s skirmishes to the massive invasion of the inland China. Have a look on the infographic here depicting the main stages of the War, and don’t forget to share your thoughts on the forums! You will have the chance to be immersed in the 1937 Sino-Japanese War very soon as Morning Sun – the second expansion of the extraordinary wargame Order of Battle: Pacific – will be released on January 28th! In Morning Sun you will revive this undervalued conflict, taking control over the Japanese forces fighting for territorial expansion and rich Chinese resources. Expect all of the fantastic features that made Order of Battle: Pacific one of the most innovative wargames recently made, plus a new array of possibilities, like the chance to employ cavalry units and invaluable Construction Group units! Stay tuned for further information and if you want to know more, please check out the product page here! Order of Battle: Pacific – Morning Sun will be available also on Steam. Everyone knows the importance of the Pacific Theatre during World War II. Some of the bloodiest battles of the whole conflict were fought on the wide oceans and in the deep jungles. After three years and thousands of dead on all sides the Japanese Empire was destroyed and a new balance of power was established. But this conflict started earlier than the Japanese attack on Pearl Harbor. China saw its own borders constantly menaced and, after many “incidents”, on July 7th of 1937 Japan began a large invasion of the Chinese soil. A nominally united China was still fighting its own internal wars and was initially ill-prepared for the onslaught leading to the Japanese forces conquering an impressive amount of land but at the cost of overstretching its lines.. The Second Sino – Japanese War has begun! Order of Battle: Pacific after the release of the successful free update Battle of Britain, comes back to the Pacific Theatre, covering one of the cruelest but most underrated conflicts of the Second World War period.. The game is ready for Beta phase and we ask players to join it to help us in giving the final touches! You can apply for the Beta from here. Order of Battle: Pacific has been updated! Battle of Britain is out! Order of Battle: Pacific has been updated with free special content celebrating the 75th anniversary of the Battle of Britain! The scenario starts on 12 June 1940 and lasts until 20 September 1940. The map covers England and the northern French, Belgian and Dutch coasts. It accurately portrays the changing German tactics in the battle, first focusing on the RAF airfields and later switching to the strategic bombing of cities. Several event pop ups help tell the story and outline the strategic situation of the battle. You control the men and machines of the Royal Air Force and must protect British shipping and cities to keep the British Morale up. You win the scenario by destroying the German command’s desire to fight by downing bomber wings and reaching out to disrupt their preparations for Operation Sea Lion. AI controlled allied convoys sail from the western edge of the map along the English Channel towards ports in London. Protecting these convoys not only prevents a morale penalty, but each ship arriving at the destination also provides the player with additional resources to assist the war effort. Secondary objectives include protecting the vital Radar chain, the destruction of Stuka bomber units harassing the Atlantic Convoys and taking out a heavy German coastal gun battery which is bombarding the area around Dover. Get more information about Order of Battle: Pacific from its product page. You can download the patch from here (PC) or here (Mac).